As more and more people live and work in the city, there is less space for green areas and more room is being taken up by buildings and streets. This development is increasing inner-city temperatures. On Marineterrein, organizations are looking for ways to introduce more greenery into the city and keep people cool by using water more smartly, such as creating blue-green roofs that combine water buffers and eco-friendly features. 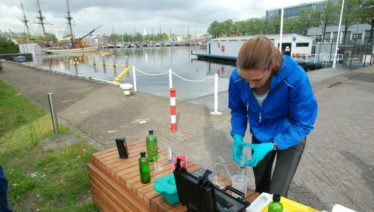 The solutions we device, test, and apply on Marineterrein help us to identify ways of making the city a greener, cooler place. 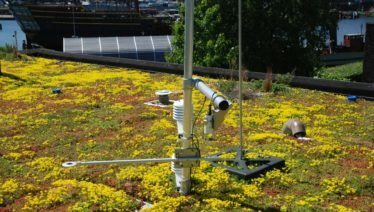 Research on Smart Roof 2.0 shows that blue-green roofs help in the insulation of buildings, the collection of rainwater, the greening of cities and the reduction of the urban heat island effect. Exercise is becoming increasingly important and swimming is one of the best ways to improve your physical fitness and your technique. The inner harbour of Marineterrein Amsterdam seems to be the perfect place for a swim, but is the water clean enough? Research will determine whether swimming is an option here. Will the Marineterrein cause a nuisance to the surrounding neighbourhood? The development of the Marineterrein and the rest of the area will be gradual. We will examine new approaches to construction logistics, such as via the water. No decisions have been made with respect to construction and no plans have been approved. Construction work is not likely to begin until 2021 at the earliest. No additional details can be provided at this time.